Some of the links in this post are “affiliate links.” This means if you click on the link and purchase the item, I may receive an affiliate commission . Driving the Golden Circle in Iceland is the classic, memorable road trip adventure for travellers visiting Iceland. 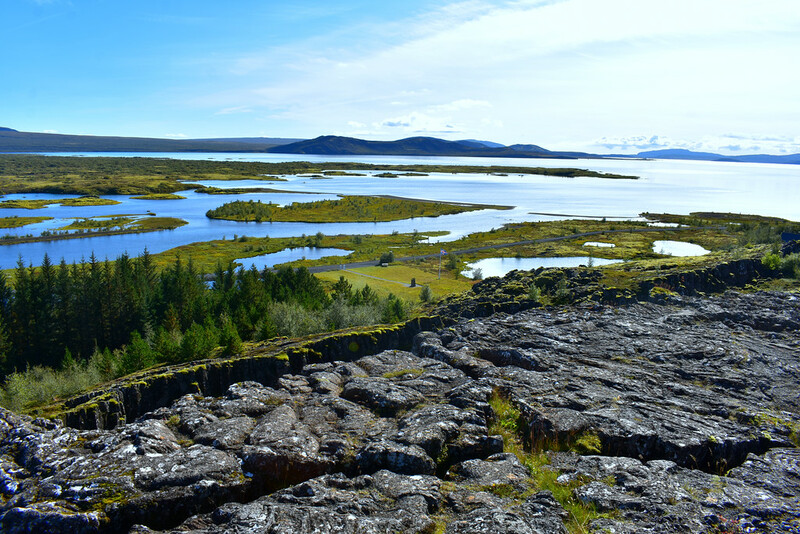 The 300km route is a great opportunity to experience the most popular destinations of Iceland: Pingvellir, Geysir and Gullfoss plus other unique points of interest on a day trip from Reykjavik. 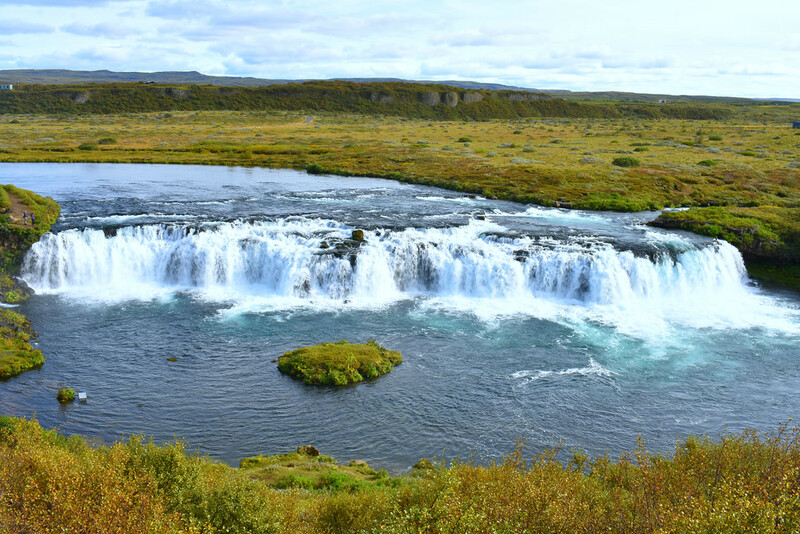 Touring the Golden Circle route is an essential day trip for anyone visiting Iceland for the first time, as the perfect short road trip for a layover in Iceland, or as the start or end of driving Iceland’s Ring Road. 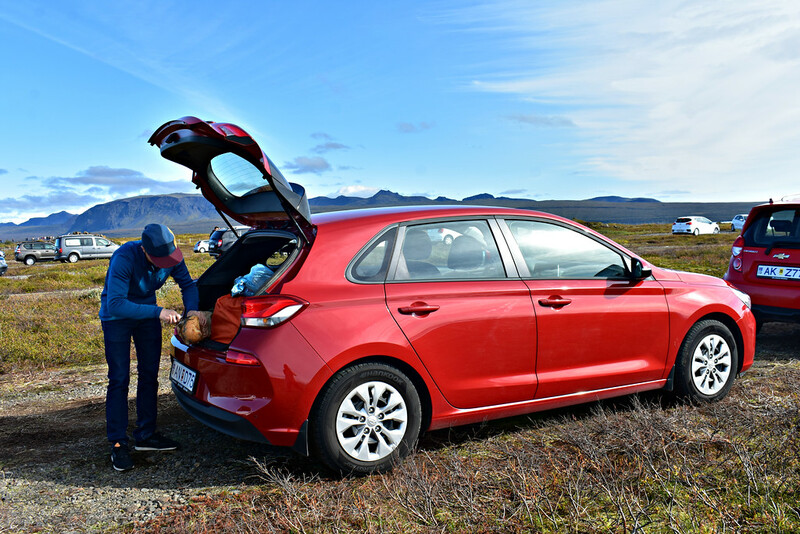 Consider renting a car and feel the wind in your hair as you drive around the Golden Circle route under your own steam. If you’re with two or more, depending on the car rental company you rent from it could be cheaper than partaking in a tour. 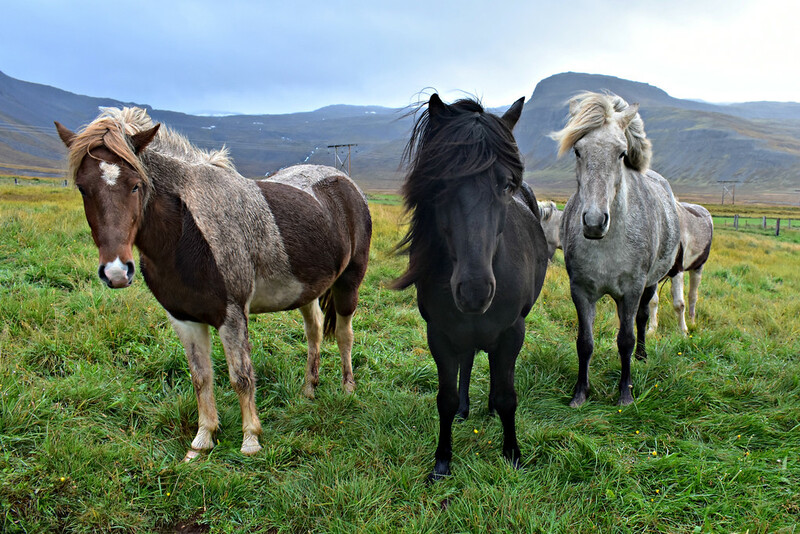 We relished in the idea of hitting the road under our own steam and picked up our rental vehicle in Reykjavik and spent the day leisurely exploring the Golden Circle circuit. 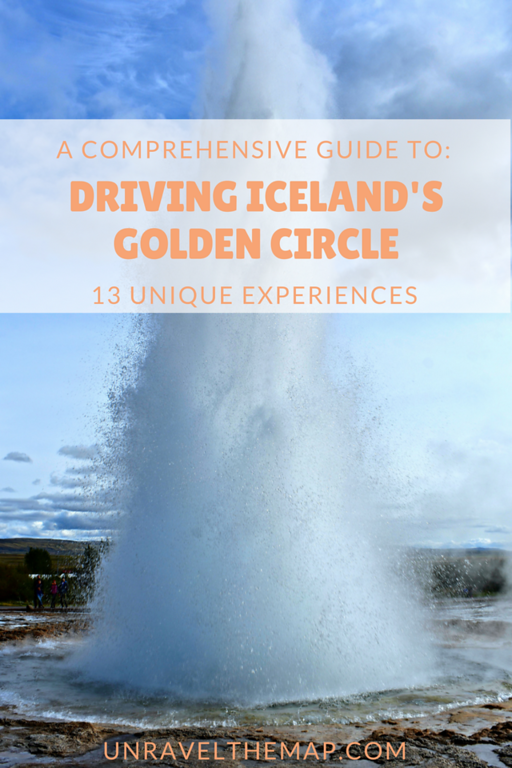 This drive it yourself guide to the Golden Circle in Iceland goes over the highlights and main attractions along the way, and providing you with inspiring photos and tips to help plan your own Golden Circle road trip. Roads along the Golden Circle are well maintained, clearly signed and often travelled. City driving is the busiest part of the journey as once you enter the country side traffic and congestion will fall by the wayside. Use common sense and adjust your speed accordingly to the often changing weather and road conditions. Always have you lights on and seatbelts fastened. Dial 112 For Emergencies. Fuel prices in Iceland are among the most expensive in the world. Gas is approximately 2USD per litre. Diesel is usually a little cheaper. Check the highlighted links for current prices in Iceland for gasoline and diesel. The main attractions of the Golden circle are Pingvellir, an important and fascinating historical and geological treasure trove, Haukadalur, a hotbed of geothermal activity and an eruptive geyser, and Gulfoss, a mesmerizing, powerful waterfall that you won’t be able to take you eyes off of. Historically, this Unesco World Hertiage Site bore witness to the establishment of Iceland’s first national parliament, the Alping, in 930 AD. Take a seat at the Lögberg or the Law rock, where early Icelandic residents would assemble annually for the Alping. 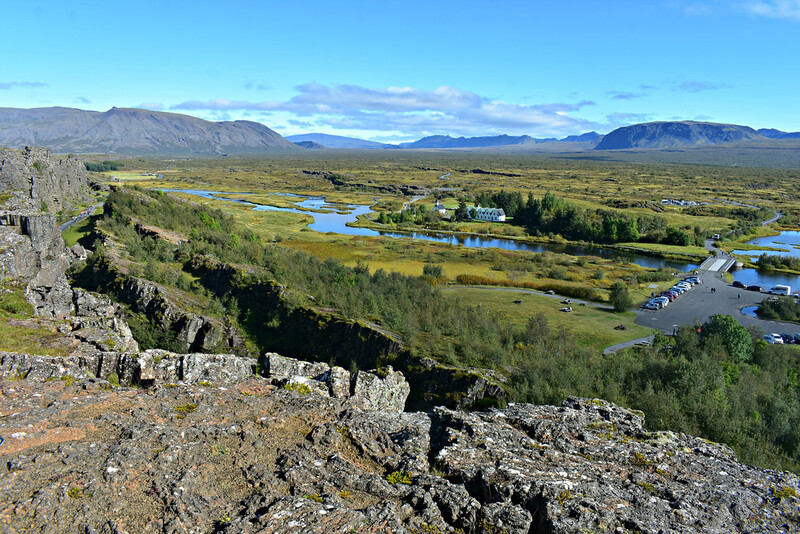 The Almannagjá rift valley within Pingvellir National Park is located on the Mid-Atlantic ridge where the North American & Eurasian tectonic plates are slowly diverging (moving away) from each other. There are very few places on Earth where it is this easily accessible to observe the effects of this geologic process! Pingvallavatn lake is the largest lake in Iceland and fills the rift plain of the Almannagjá rift zone. The lake is and abundant with Arctic char fish and consequently popular with migratory birds. Gorgeous views are had at viewing platform near the Interpretive Centre. 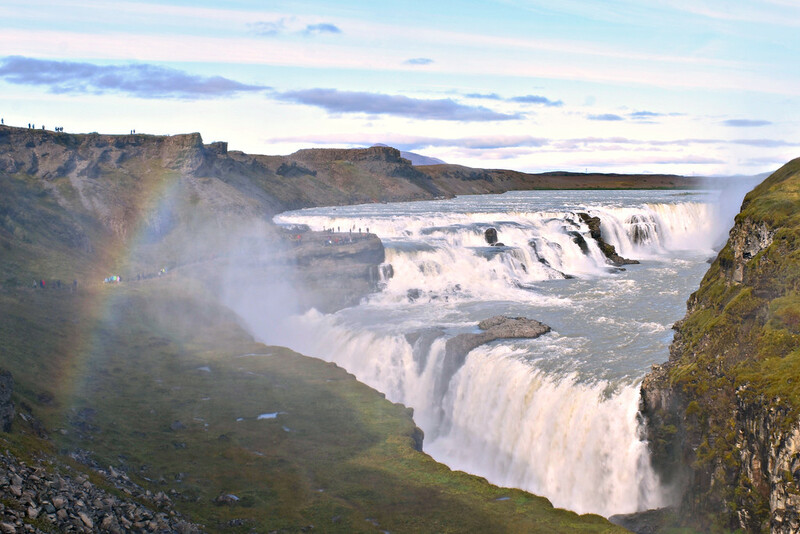 Öxarárfoss is sourced from the Öxará river and varies in volume depending on the time of year. 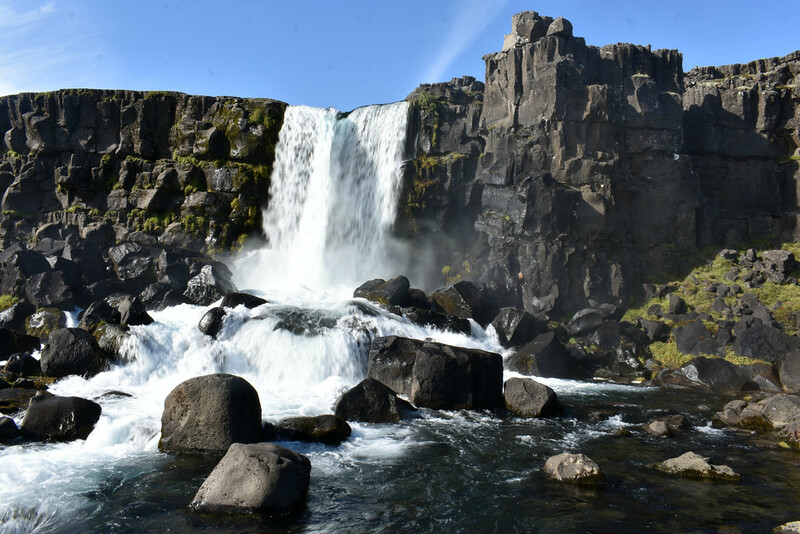 Enjoy the rush of the flowing water as it tumbles down over dark basaltic columns and onto the Almannagjá rift plain. Well maintained walking paths are available on the rift plain. Visit the farmhouse, Pingvalabaer, built in 1930 to celebrate the milleniumth anniversiary of the Alping. Next to it is the Pingvallakirkja, the site of one of Iceland’s oldest Christian churches from the 11th century but now occupied by a mid-nineteenth century wooden building. The next show stopper on our Golden Circle journey was the the active geothermal region of Haukadalur. The Earth here is piping hot with steam arising from fumaroles and geysers. The mud bubbles and jumps around in small mud pools. The distinct scent of sulphur wafted into our nostrils. 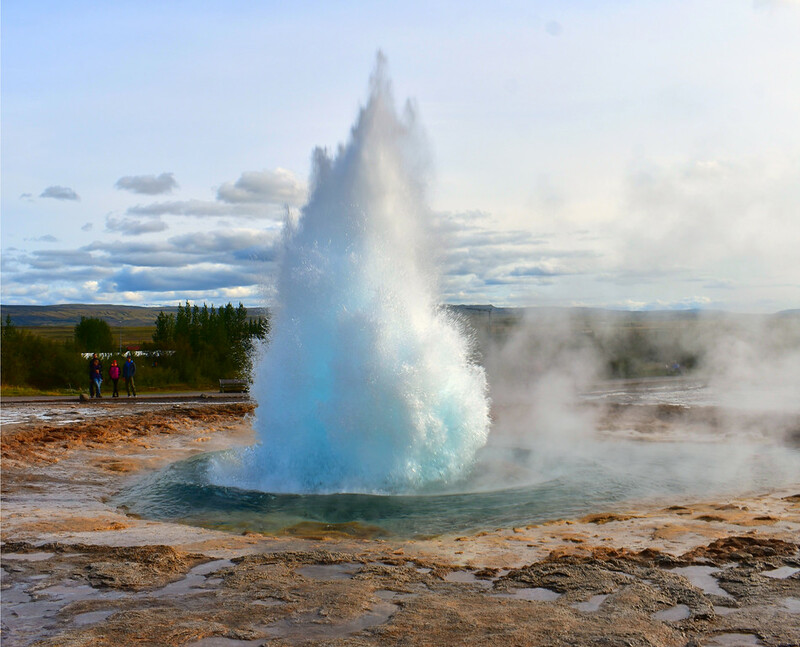 Strokkur geysir is an active geothermal geysir that reliably erupts every 5-15mins. A terrific and exciting sight to watch the water explosively rise to heights of 20m in the air. Even more famous is Geysir, the original hot water and steam spring from where the English vocabulary word geyser stems from. How cool is that! There are gift shops, stores, cafes, and hotels available in Haukadalur. The voluminous Ölfusá River thunders down into a ravine at the popular double tiered Gulfoss waterfall. The wide, rapid river swerves almost perpendicularly before plunging into a 32 metre or 105 feet crevice and disappearing from view. A spectacular sight to behold from every angle. Thick mist, huge sprays of water, and prevailing winds make photography difficult at the viewpoint overlooking the Ölfusá river East of the parking lot. The water droplets and sunlight merge to produce a rainbow showcasing natural kaleidoscope of color. Descend the staircase and pathway to experience the powerful, roaring waterfall up close and take in the impressive view peering down into the deep, narrow valley. We recommend wearing warm layers and waterproof clothing for protection against the wind and the frequent spray of water arising from Gullfoss. After ascending to the parking lot level, walk along the edge of the cliff overlooking the falls and gaze out at the beautiful, lonely landscape. Feeling hungry? 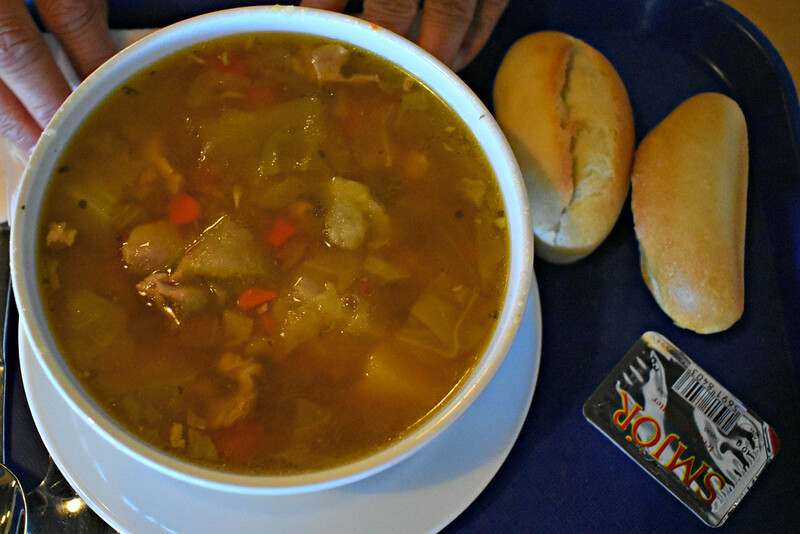 The Gullfoss cafe offers delicious meat soup with bread with free refills! So grab a table, two spoons to share, and unwind. Go at your own pace and see where it takes you along the Golden route and relax knowing you have the freedom and flexibility to take those off the beaten roads that pique your interest and customize your trip with unique detours. 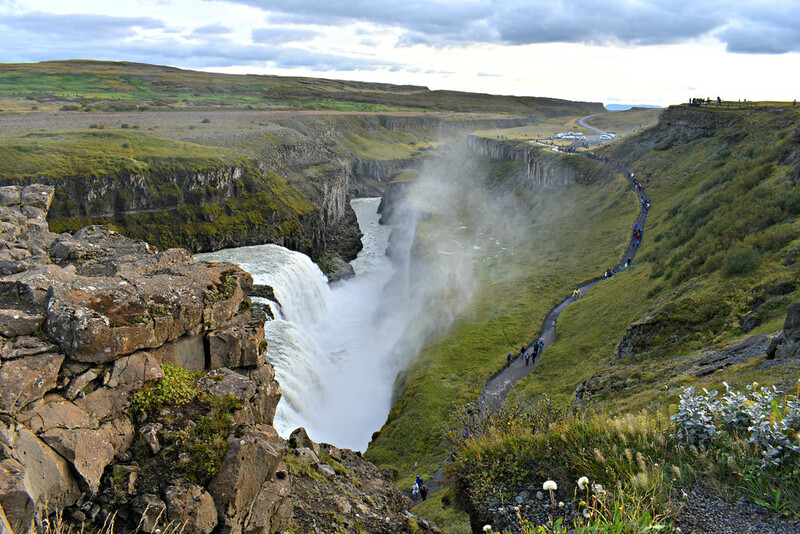 Following the impressive Gulfoss, you can opt to make a quick stop at another less known waterfall along the Golden Circle. 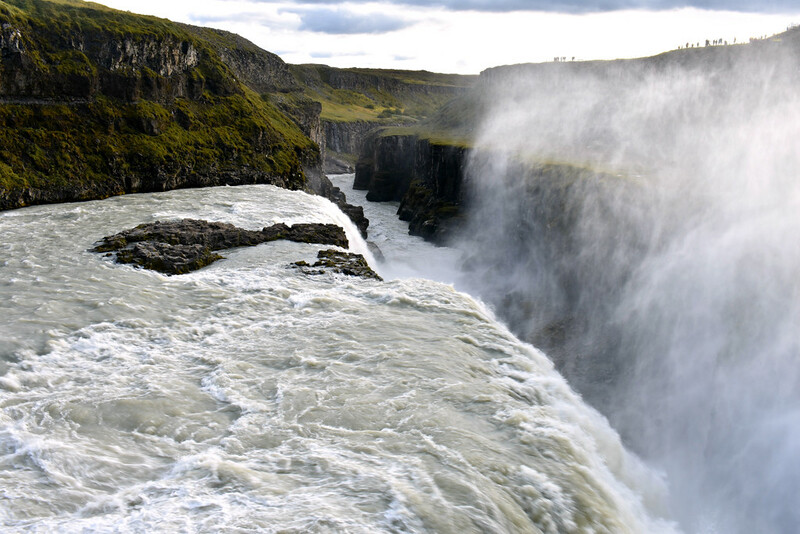 Faxi waterfall is a low and wide cascade situated on and spanning the width of the Tungufljót River. It’s a soothing spot for a lunch picnic or an overnight stay at the campsite in the area. Can’t get enough of waterfalls? If daylight is waning, finish your road trip on the Golden Circle at Kerið crater, a red volcanic crater embellished in green mossy vegeation. It is likely that Kerið began as a cone volcano but collapsed and formed a caldera after emptying out the magma chamber in the Earth’s crust. The quiet town of Skálholt was the country’s first town and the site of the first established Icelandic school. Iceland’s first bishop made his home there as well and the striking cathedral is worth a visit. The geothermally active area in and around Hveragerði makes for a unique experience. Visit the free geothermal park Hverasvæðið to watch bubbling mudpots and steaming boreholes. 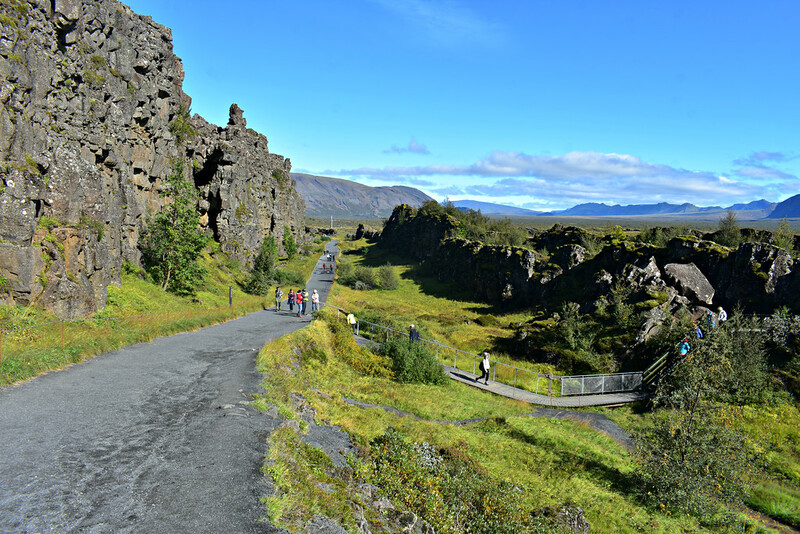 North of town, hike 3km one way to Reykjadalur, a scenic valley with a bathable hot river of varying temperature. The humble village of Sólheimar is an eco-friendly, sustainable and thriving community of 100 permanent residents. The Icelandic vilagers actively work together for the benefit of the entire community and in particular with those with disabilities or special needs. Great location to base yourself from when exploring the Golden Circle. Unwind and slow down at the Fantana Geothermal Baths in Laugarvatn. Access includes steam rooms, a traditional Nordic sauna, and heated pools. The spa overlooks a scenic lake with a mountainous backdrop. Great (and cheaper) alternative to the famous Blue Lagoon. 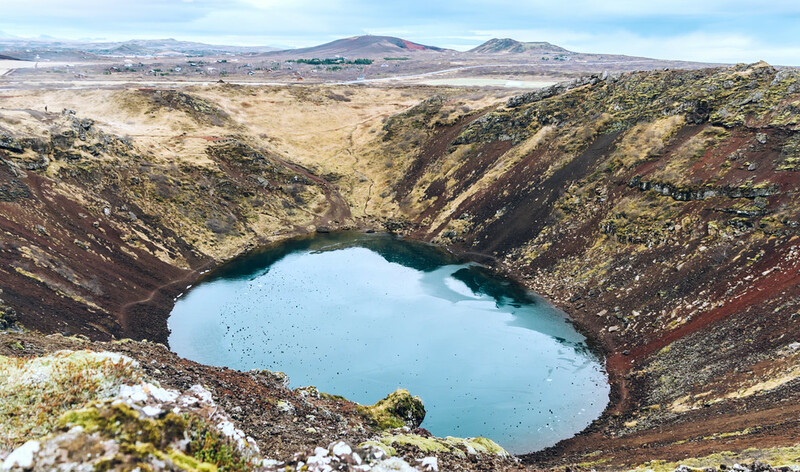 Gamla laguin, otherwise known as the Secret Lagoon, can be found in the small village of Flúðir. This natural geothermal pool holds the title as the oldest swimming pool in Iceland. These days locals and visitors continue to frequent the natural hot springs for the natural surroundings and magical atmosphere. Expect basic facilities and services and a unique experience. The farm at Efsti-dalur serves fresh, mouth-watering, homemade ice-cream at their Ice Cream Shop sourced from the dairy cow barn next door. Additionally, this versatile farm offers a B&B and restaurant should you decide to stay longer! Have lunch at Friðheimar where the food on your table is fresh and grown directly from the farm . All you can eat fans rejoice as their delicious tomato soup and bread have this option available. Google Maps will tell you it only takes approximately 3 hours of driving time for complete the Golden Circle. However with stops and exploring roads less taken it is easy to rack up more driving distances and time spent in the car. Combine this with a respectable amount of time spent at each attraction and you’ve got a full day ahead of you. Self driving the Golden Circle gives you the wonderful opportunity for a custom tailored experience. Kex Hostel – Social atmosphere, trendy interior design, delicious food, live music, reasonable prices and close to the centre of town. Rey Apartments – Excellent value, clean and bright living spaces in the central of Reykjavik. Reykjavik Residence Hotel-Centrally located, exceptional customer service, spacious and comfortable high-end accomodation. Galaxy Pod Hostel- Sleep in private, fully enclosed space pod in a dorm located in downtown Reykjavik. Close to bars and shopping opportunities. Still not convinced about self driving the Golden Circle? If you don’t feel comfortable to drive in Iceland, especially with a manual transmission or would rather have someone else handle the logistics than by all means join a tour group! There are plenty of Golden circle tours available to get you around quickly and safely. The Lonely Planet Iceland book travelled with us the entire time we were in Iceland. We found it to be a comprehensive and useful book while driving the Golden Circle and on the Ring Road. We recommend waterproof jackets and boots, quick drying pants, warm layers, and a flexible attitude! Shop our favorite Iceland travel essentials! Which natural attraction interests you the most? Would you drive or take a tour of the Golden Circle? Like this post? Sign up for our FREE monthly newsletter for exclusive travel deals and reels, tips and advice, inspirational stories and ancedotes, and more! The sheep and doors things are 2 challenges to be aware of Lisa. Sometimes we cruise along and forget weather conditions change fast in a place like Iceland. I love it personally being a meteorology major in college. Fascinating. As for the sheep it’s about keeping your eyes peeled. Some animals are beyond chill in off the beaten path spots and tend to do things that animals in more populous spots may not do; aka, sleeping on the road LOL. I thought Canadian weather changed quickly but I think Iceland takes the cake. I remember once we were driving along in thick rain and wind and when getting out of the car we had to hold onto the doors tightly and then forcibly close them! As for sheep, there are more than 2x as many sheep than Icelandic people living in the country! Not only that but many of them roam around freely from Spring to Fall. We definitely agree that the animals living in seldom touristed parts of the country tend to be more relaxed and dawdle on the road compared to those in touristy areas that are used to sprinting across the road if a car gets close! Wow, the photos are amazing. I have some friends who are in Iceland right now, visiting. I hope one day I will see it as well. I don’t have a driver license but I think they have some organized trips that I could take if I made it there. The seeps are so funny, how they stay on the road. Oh my gosh, this would be such a stunning drive. I hope to be able to do this one day. I’d really like to see that crater. I told my husband I wanted to go to Iceland for our anniversary. A few weeks later my youngest informs me she’s just dying to see the Northern Lights. Any chance of going with just my husband just disappeared. Such beautiful sights, he would have no issue driving himself. I would love to go to iceland one day! We have never been, but it has been on our bucket list for quite some time. Wow!! Iceland is so pretty. I would love to take a drive and explore it all for myself. Iceland looks incredible. I’ve been wanting to do this drive of the golden circle for years. I find Iceland so interesting and can’t wait to explore it. Totally pinning this post for later! Also loved your section on the geyser. I find the origins of words completely fascinating. Nerd alert 🙂 Great post. Oh you say Geysir! I would love to see one too! Those picture are awesome, and this guide is perfect! Iceland has been in my mind for quite some time now. Golden Circle seems like a nice place. Look at that gorgeous falls! Just WOW! I’ve never been to Iceland before but I’ve heard so many lovely things about it. This guide is awesome and it makes me want to travel to Iceland right now. It’s such a beautiful place. I find Iceland trip interesting to try. The sudden change of weather brings thrill but is also risky. It reminds me of the last movie I saw featuring Iceland; Journey to the Center of the Earth. I felt like I was on an adventure. Great post. The photos are absolutely amazing. That soup looks good! I bet the fact that they offer free refills makes it even more appealing. I’m glad you had a nice time, Iceland is so pretty. Thanks for sharing. Iceland looks gorgeous but the random sheep is what really drew me in haha. I would love to see the geysirs because I’ve never experienced anything like that before! It sounds and looks fantastic. A very good friend of mine visited Iceland years ago and he actually mentioned the golden circle, I had forgotten until today. Amazing! Those photos are truly breathtaking! I haven’t been to Iceland but love to add this on my bucket list. Wow that’s an incredible amount of sightseeing you can see just in a day driving trip! Also Iceland is absolutely stunning and I would definitely add it to my bucket list of places to visit. All I know about Iceland really is the lagoons. I love the scenery of this place thanks for sharing! Wow! These pictures are so gorgeous, I especially love the ones of Pingvellir National Park… Iceland is definitely on my travel bucket list, and now this drive will be as well. Must have been such an amazing experience for you. 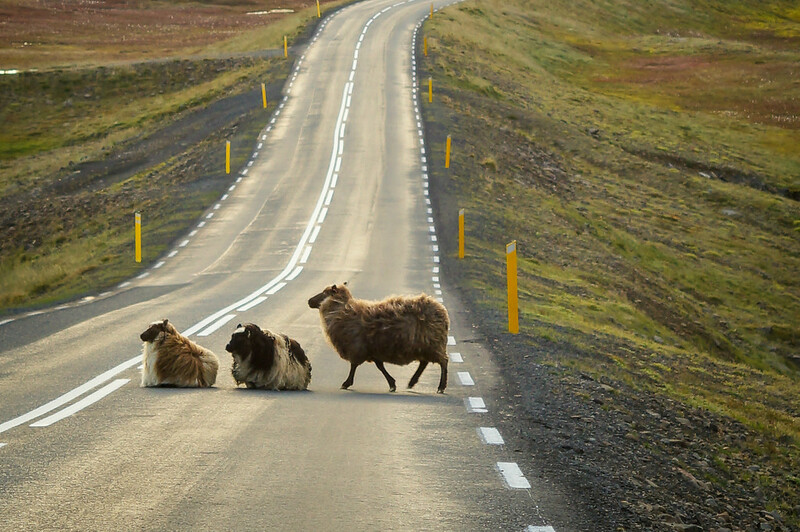 I always enjoy road trips.This article on driving Iceland’s Golden Circle sounds a complete guide for anyone who visits this destination.I also like the image with sheep.I am sure these sheep make tourists exciting,but,at the same time it is dangerous for the safe driving. Thanks, the place looks great, possibly this year I will visit the Iceland to have a good time. I love driving!! And this road is such a beauty!! National parks are always fun too!